Every time I am to reach for an album labelled ‘industrial rock’ I am struck with a feeling of uneasiness, as the majority such productions are mediocre or simply weak, which is more than enough to undermine my faith in the genre. 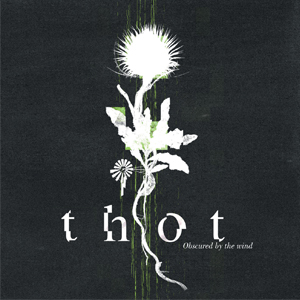 However, every once in a while there appears an exception which levels the entire competition to the ground, and that exception is the first LP of project Thot ‘Obscured by the Wind’, which right after I launched it, gave me a slap for I let my faith to waver. To make it easier I could say that what Thot offers is what years back Trent Reznor presented on ‘The Fragile’. The similarities between the two albums are quite obvious, however one should not claim that ‘Obscured…’ rips off the ideas that are 13 years old. And off the record, Trent could (or maybe should?) listen to the Thot’s LP to remember that he also used to make music on a decent level. I assume that after reading the two paragraphs above one has created an image of what they can expect to find on the disc. Yes, ‘The Fragile’ is in the air, especially when considering the sound of guitars and the combination of electronics and acoustic instruments, which of course sounds great. The best effects Thot reaches when every element of the music is joined together creating a strapping wall of sounds (see: ‘Take a Bow and Run’), thanks to which the music is enriched with an additional industrial glitch. Fortunately, such tunes are not the only aces up Thot’s sleeve. Apart from the above mentioned, there are also more subtle tracks (brilliant ‘Blue and Green’), which adds colour to the production and keeps the boredom away. A separate ‘congratulations’ is due to the vocals of Gregorie Fray, whose voice sounds like a mixture of The Cure vocalist and Mikee Goodman from Sikth. Whether its an energetic tune or a calm one, Fray sounds great, no doubt about it. Present on the album are also female vocals, adding a nice edge to the concept of the LP. I’m bloody glad such albums and such projects exist and are crated. ‘Obscured…’ has no weak points, no length issues (which by the way is often a vice of the contemporary bands), and most importantly, does not get mundane after first few tracks. Truly, a delicious proposition, and I’m waiting for more.